Science Museum Object Number A544: Preserved human skin, tattooed with a series of patterned dots and crosses; initials and lettering in French; two hearts, including one pierced by arrows; and the head and torso of a man. Photograph © Gemma Angel, courtesy of the Science Museum, London. Wounded human skin with various crude tattoos, probably French, 1850-1920. The photograph above shows the ‘wound’ in question – a straight, vertical tear, measuring 58mm in length, cutting through the centre left side of the specimen. The edges of the fissure are dotted with 25 small pinholes, suggesting stitching; but this wound never healed, and these punctures marks were not made with therapeutic intentions. In fact, the skin has been pinned in this manner as part of the preservation process. As the skin dries, it shrinks, causing it to wrinkle and warp. This can be avoided by pinning out the skin whilst it’s still soft and pliable, thus retaining a smooth, undistorted surface once fully dried. Some shrinkage will nevertheless occur around the pins, resulting in a characteristic ‘frilling’ along the outer edges of the skin; this effect can also be all seen in the so-called wound above. Examining the tear more closely, it appears very straight and smooth-edged, suggesting that the cut was made with a sharp implement, such as a blade. The pinholes and the absence of any signs of healing indicate that this ‘wound’ was either sustained not long before death, or that the skin was damaged postmortem. 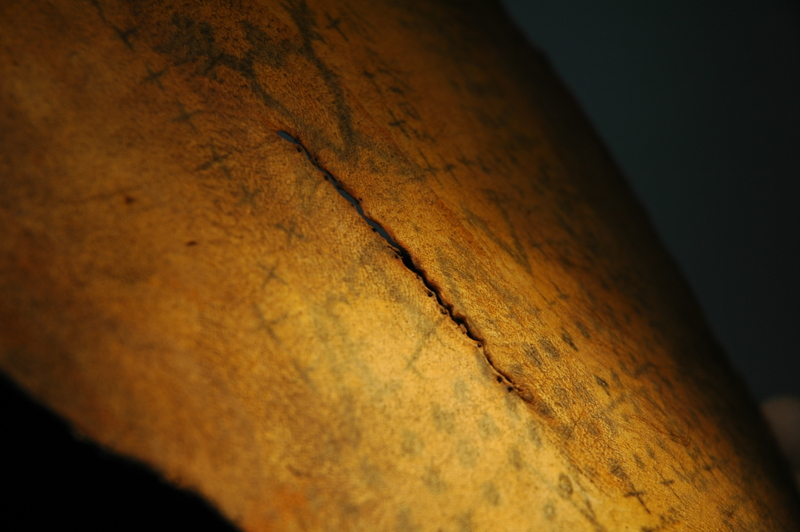 Tears and damage to the skin are not uncommon in the collection; there are many examples in which the tattoos are not preserved in their entirety. Particularly in the case of soldiers, who may have suffered extensive – and fatal – injuries, it is easy to imagine that the collection of intact tattoos would often have been impossible. Tattooed human skin (Science Museum object no. A544). 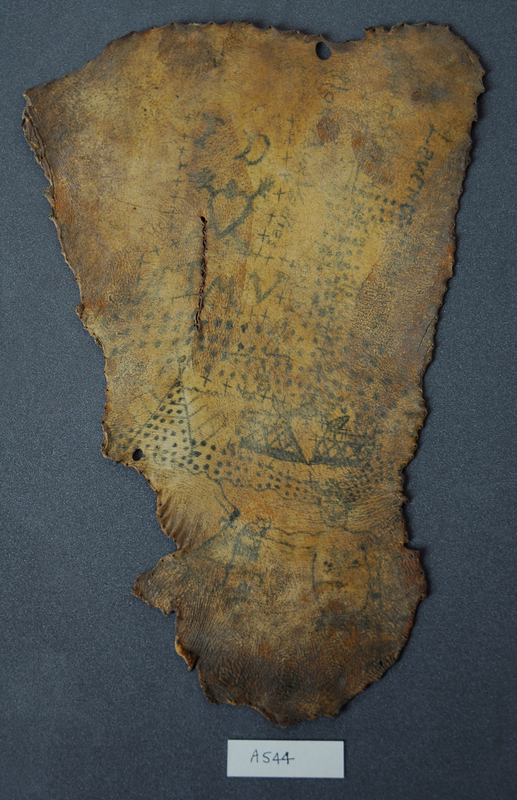 Another interesting quality of this tattooed skin is its readily identifiable body-location. As I handle the skin, my observations lead me to conclude that it was once part of a lower arm; it roughly matches the length of my own arm up to the elbow, and the lower, rounded portion is very suggestive of a hand. On laying the skin over my own hand, I notice a pattern of wrinkling and gathering consistent with knuckles, corresponding with the spacing of my fingers. Viewed with a back-light source, I see that these areas of skin are much thinner, as might be expected over the knuckles. There is also typical lining in horizontal bands across the back of the wrist, and the skin has shrunk and wrinkled in the fleshy space between the forefinger and thumb. The positioning of the digits suggests that this was the left arm. You can read more about the tattoos on this specimen here. © Life & 6 Months, 2012. This entry was posted in From the Storage Archives, Museum Collections, Tattoo Iconography and tagged archival quirks, archive stories, archiving, cataloguing, curating, curator comments, human remains, museum archives, museum cataloguing, museums behind the scenes, preserved tattooed skin, Science Museum, tattooed skin collection, Wellcome Collection. Bookmark the permalink.